I spotted this pair in Boots recently and fell so head over heels in love with the scent that I had to snap them up immediately. Herbal Essences remind of being a teenager, I used to be obsessed with the fruity, floral-y scents when I was in School and to be honest, they all still smell flipping amazing. 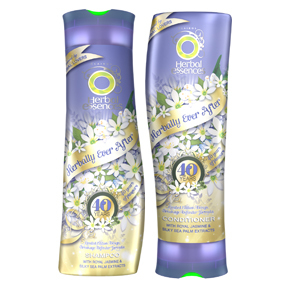 The Herbal Essences Herbally Ever After range was created to celebrate as they say "40 years of pleasure in and out of the shower" and there are quite a few different scents from the range. I went for the Breakage Defender Formula, which I didn't realise until after I'd bought it if I'm honest, I was completely swayed by the smell and packaging with this one, but it's quite lucky really because it's quite a good match for what I normally go for, I can't say I've noticed a massive difference in the brittleness of my hair but it does leave it my hair feeling lovely and soft when I use it, I don't think it would be great for those with oily hair, mine is borderline at the minute and it does feel like it's quite a heavy product when I use it because it is quite moisturising. The packaging is very cute, purple packaging with a green lid and a special limited edition wrap with Jasmine Flowers and Gold star bursts working up from the bottom, I'm not sure why but it reminds me of the film Tangled (I love that film!) and boy oh boy, These smell AMAZING, it's made with Royal Jasmine and Silky Sea Palm Extracts and just smells really Fruity, Fresh and Clean, the smell lingers in your hair as well for a good day or so after using it. These are currently in the 3 for 2 offer across haircare and selected makeup in Boots so check them out if you want your hair to smell, quite literally, divine! p.s Apologies for the stock image but mine are looking a bit battered and I've lost the photo's I took of them when I bought them! 2 comments on "Herbal Essences Herbally Ever After Breakage Defender Shampoo & Conditioner"
Love Herbal Essences, but never tried this one. The packaging is so lovely! Herbal Essences always have great smelling products! This packaging is soo cute, I wouldn't be able to resist haha.